For those who believe that the minor festival of Chanukah should be celebrated with more gusto. Happy Chanukah! The Calabasisher Rebbe, the RiPiK, teaches: One does not fully celebrate Chanukah, the Festival of Lights, unless one does 11 rituals over the 8 nights. Lights the candles and puts the Chanukiyah (Chanukah menorah) in the window to publicize the miracle. Print out the Chanukah blessings. Tell the story of Chanukah. This is a festival when Jewish values triumphed over Greek pagan practice, when religious freedom overcame the impulse for religious coercion. An important reminder that America too is home of religious freedom. Download the story. Sing Chanukah songs. We transform king Antiochus’ impulse to annihilate the Jews through simcha, the impulse to celebrate life and Jewish living. Singing is the glue that binds us to the Jewish soul. Get Cantor Cotler’s Favorite Chanukah Songsheet. Eat latkes or sufganiot (jelly-filled donuts). Both are cooked in oil, allowing us to consume the message of the Chanukah tale, that oil enough for only one night lasted for 8 nights. By playing with our food (or better, eating it), we become the oil, prepared as Jews to outshine any impulse to give up our values. Read the recipes. Give presents. Cool to give, cool to get. But be wary of becoming too materialistic. Have Parents’ Night. Set aside one night only for kids to give to parents. By insisting on this and helping facilitate it, we teach our children the values of kibud av v’em (honoring one’s father and mother), and ahava (love means giving, not just getting). Give Tzedakah (charitable giving). Set aside one night for only giving tzedakah. Everyone contribute something, then as a group choose recipients and amounts. Search the web for do gooder organizations. Here’s my 8 ideas for 8 nights of tzedakah. Celebrate with family and friends. ‘Nuff said?! Celebrate with community. Congregation Or Ami’s multigenerational Chanukah celebration on Friday, December 23, 2011 at 6:30 pm is open to the entire community. Bring a Chanukiyah to light. Enter a plate of homemade latkes into our Latke Baking Contest. Play the dreidel game. Through sacred play, we reteach that Nes Gadol Haya Sham, a great miracle happened there. Play with chocolate gelt, raisins and nuts or M&M’s, and the spoils are tasty too. Review the rules for play. Remember the (second) Miracle. Yes, that oil enough for one night lasted for 8. But as significantly, think about that one Jewish priest in the Jerusalem Temple who, knowing there was not enough oil to last until new oil could be made, lit the menorah nonetheless. From him we learn the eternal Jewish value of Tikvah, hope. Jewish families never give up hope because we believe that goodness is just a night or 8 away. Resist the urge to allow Chanukah to become just 1 minute of candle lighting and 3 minutes of gift opening. Celebrate the Festival with these 11 rituals. What did I miss? Do tell!?! For everything you need to celebrate Chanukah, take a look at Congregation Or Ami’s Chanukah resources page at www.orami.org/Chanukah. Over Memorial Day weekend, 1991, 14,325 Ethiopian Jews fulfilled their dreams of making it home, as they were airlifted from Ethiopia to Israel in 36 hours of around the clock flights during a covert military operation known as Operation Solomon. At the time, the sitting government of Mengistu Haile Mariam was close to being toppled by Eritrean and Tigrean rebels, thereby threatening Ethiopia with political destabilization. Concurrently, the Mengistu regime had made mass emigration difficult, and the regime’s dwindling power presented a promising opportunity for those who had been wanting to emigrate. Operation Solomon airlifted almost twice as many Ethiopian Jews to Israel as Operation Moses. The operation set a world record for single-flight passenger load when an El Al 747 carried 1,122 passengers (1,087 passengers were registered, but dozens of children hid in their mothers’ robes). Planners expected to fill the aircraft with 760 passengers. Because the passengers were so light, many more were squeezed in. Two babies were born during the flight. What Does a Jew Pray on the Secular New Year? For all these and more we offer thanks. Baruch Atah Adonai, hatov shimcha ul’cha na-eh l’hodot. and to You we offer thanksgiving. All praise to the Source of Being. Are you prepared for Chanukah? Take the "Am I Prepared for Chanukah?" Quiz. There is something very spiritual about Thanksgiving. 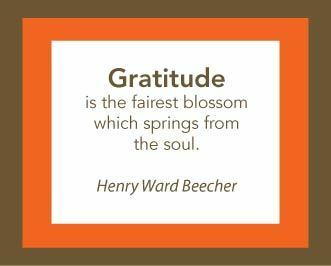 Thanksgiving is one of my favorite holidays because of GRATITUDE. Gratitude is especially spiritual. When we slow down and take the time to articulate the blessings in our lives, we necessarily venture into a higher plane of existence. We transcend our yetzer harah (our inclination toward lustful neediness) to get in touch with our yetzer hatov (our inclination toward the good). We discover the holy amongst the regular. As part of a bi-coastal family, I enjoyed the opportunity to twice articulate my gratitude: first, over the phone, to my East Coast family gathered at my brother’s home, and again, at our own California dinner table. Thanksgiving food is universally delicious. When the senses (taste buds, smell, sight) are heightened, we recognize the beauty and holiness more). I usually get in a deeply restful nap between the meal and dessert. A rested person is more apt to recognize the spiritual. We gather family together for a non-rushed, gratitude-filled evening. Spirituality blossoms when we are relaxed. We try to open an especially good bottle of wine. (See #2.) The smell of a great wine is as delicious as its taste. This rabbi has no responsibilities beyond helping prepare the meal. In what ways do you find Thanksgiving spiritual (e.g., meaningful, inspired, transcendent)? Happy (belated) Father’s Day! My day began like many others. I woke up before everyone else, and read the paper on the internet. I watched with a chuckle as the kids woke, groggily gave me a kiss, turned on their computers, read on ESPN website that it was father’s day, and then smiled sheepishly to wish me a happy one. Five great cards (one from each child; two from my wife) with heartfelt messages. I read on my new Kindle, the Father’s Day present that – with my wife’s permission – I bought myself last week. Dinner at a sushi restaurant. Then waking the day after, realizing I neglected my new Mother’s/Father’s Day ritual: writing the Top Ten List about my parent (See my 10 Lessons I Learned from My Mom, Linda Kipnes). So here goes. By the way, that’s my Dad, Ken Kipnes, on the left, with my mom Linda and our three children. Tease, tease and tease some more. My dad can be silly and is a master teaser. There was the time he tried to convince them that he hunted and shot the turkey they ate for thanksgiving. The time he dyed his goatee red just so he could be a redhead like 2 of my kids (the joyful look on his face when he saw the look on their faces was priceless). Of course, the only thing that gives him more pleasure than being able to tease his grandchildren is when they become so smart that they won’t fall for his teasing (and tell him so). There is a difference between being Aged and being Old. Your age is a chronological number that starts at birth and gets bigger as you live. Old is a state of mind. You can have a high age, but still feel young (or younger). But if you succumb to the number, or to life’s disappointments, you can quickly become angry, bitter, crotchety and “old.” Though he didn’t say that, he surely seems to illustrate it. My dad has age (born in 1936, he just turned 74). But he (and my mom) have shown an amazing ability to remain young – traveling, entertaining, rolling with the challenges that life brings them. And even as they slow down a bit, they continue to inspire me with their relative youthfulness. Ahavat Yisrael – Love Israel. My dad loves Israel. He loves learning about her, studying Hebrew (he learned in an Israeli ulpan once and practiced with his Israeli born grandchildren), supporting her. He worries about her like he worries about his 4 children; he kvells at her successes too! If he had his druthers, I think, he would live in Israel a few months a year. Though his heart ached all those years that my sister and her family lived there, I know he reveled in the ability to spend extended periods of time there. Dad and Mom took us to Israel after my sister’s Bat Mitzvah service, and though having me away for a year pained them, they allowed me to spend my first year post-High School on a Reform Movement leadership program year in Jerusalem. Take it as it comes. One of my dad’s stock phrases whenever he is faced (seemingly regularly) with the challenges life brings, these words express an outlook on life that seems healthy. It is also easier to say than to live. Though life may get us down, we have no choice but to take it and live on. Sometimes have Candy for Breakfast, Ice Cream for lunch, and Cake for dinner (though not all on the same day). When I was young, my folks took us to Kimball’s Farm for Sundae’s for lunch. When my kids were young, my dad kept a drawer filled with candy bars. He would gleefully show it to our kids and, as only a grandparent could, told them them this was theirs until it ran out. Now he makes fudge and bakes delicious strudel and Mandelbrot (my mom makes the most tasty brownies and seven-layer cookies). When he arrives at our home or we at theirs, the sweets come out immediately so we just have a taste (or three). Where did it come from? Perhaps from his mother was a master baker and his dad – who owned a bowling alley – who always had a box of huge chocolate bars on top of the fridge or, when they visited us, in the car. Youth are our future. My dad was a tireless supporter of our temple youth group and NFTY youth movement. He believes that you put money, time, and effort into sustaining our youth so that they grow up to become the committed Jewish leaders of the future. He still administers the Camp/Israel scholarship funds down on Cape Cod, where they give merit scholarships to young people toward these formative Jewish experiences. We can reinvent ourselves. I saw my dad go from the accountant in Duddy Tires Company, to owning his own optical shops, to being an accountant, to owning his own accounting firm, to partnering with my brother in the firm, to working with/for the guy to whom he sold much of his practice. He has shared successes and disappointments and failures. He showed me that we are more than our work, that our success is in family and community. He showed me that we can always begin again. Hearing a loved one’s voice sometimes is all you need. I discovered sometime my college/grad school years that what I told my dad was less important to him than the fact that he got to hear my voice. So I call him now regularly (often daily), just to say hi and so that he can hear my voice. I learned that I too inherited the “I just want to hear your voice” need. These days, I struggle sometimes that intensive texting with my kids sometimes supplants their need to speak by phone. See my Did You Call Your Father (or Mother)? Over the years, my dad taught me important lessons about love, perseverance, centrality of family, forgiveness, taking responsibility, balancing finances, finding joy with whatever your kids love (or at least faking it), loving being Jewish, and more. My dad Ken Kipnes is the best dad of all. Dad, I know you will read this eventually since Mom subscribes to my blog! So Happy belated Father’s Day! Leader: Today we give thanks for mothers. All: For loving nurturers and strong providers. Leader: For mothers who birthed us, for mothers who raised us, mothers of birth and of choice. All: For stepmothers and adoptive mothers and all those who have a mothering role in our communities. We give thanks. Leader: For mothering energy in all its sources, from women, from men. All: For the Creator God who is mother to us all—we give thanks. Leader: Today we give thanks, we give praise—and we remember the dangers of motherhood. All: Giving thanks is not enough. We must do more to protect mothers here at home and around the world. Leader: So many die in childbirth. So many more become sick or injured during pregnancy. All: Give us strength, O God, to do all we can, to protect these most vulnerable women. Leader: We think not only of mothers we know, mothers in our family, in our community. All: In this our global family, every woman is my sister. Every woman, even those whose name and face I will never know, is my sister, a fellow child of God. Leader: For every woman who dies while bringing new life into the world—who dies because she could not access medical care. All: Am I my sisters’ keeper? Leader: For every infant life that ends too soon, due to lack of health care. For the pain of that mother’s loss. Leader: For every woman who wishes to be a mother but cannot. For every woman who does not have the resources to have a healthy pregnancy and to care for the children she already has. Leader: We are our sisters’ keepers. We are the hands of God, the work of the divine in the world. All: We give thanks to our mothers, by praying and working for the safety of mothers and future mothers throughout the world. Leader: Creator God, Mother and Father—protect and watch over mothers. Give your strength and protection and love to all who give a mother ‘s love to those in their family or their community. All: Loving God, keep mothers safe. And give us the strength to work to ensure that all who wish to bring life into the world can do so in safety and joy. Leader: Am I my sisters’ keeper? All: I AM my sisters’ keeper! I am drawn again and again to A Tale of Love and Darkness, Amos Oz’s memoir of his early life in a young and bewildered Israel, a country which does not even formerly exist as such until a couple hundred pages into the book. Every Yom Ha’atzmaut, Israel’s independence day, I think back to the passage in which Oz describes crawling into bed at three or four in the morning, still fully dressed, after celebrating the U.N.’s vote to create the state of Israel. Only his left hand saw. We remain in this moment with him – still our hand searches in the dark, tries to reach back in time to touch the moment of Israel’s creation, to grasp even a bit of what it must have been like to live through that time. Oz does not choose the more reliable senses of sight or sound to translate the emotional incredibleness of one night years ago. He uses touch; and while we might imagine the sensation of hot tears on skin, something remains always out of our reach. Oz, one of our greatest writers, comes close to but cannot pin down the ineffableness of that moment. Emotionally we get it, but putting it into words is like assembling a puzzle in a dream. But Oz invites us to try – with all our senses. So I challenge you to do the same. Celebrate the event that made even Amos Oz’s father cry with joy. Tonight, as we move from Yom HaZikaron, Israel’s memorial day, to Yom Ha’atzmaut, let’s celebrate with all our senses. Today I want to recognize and publicly acknowledge for the first time some very important people in our congregation. They are part of Congregation Or Ami because, somewhere along the way, they happened to fall in love with a Jewish man or woman, and that decision changed their life. I want to let you know in advance that in a few moments I am going to be calling up all non-Jewish spouses and partners to come to the bima for a special blessing of thanks and appreciation. I hope that you will not be embarrassed or upset that I am singling you out in this way. The last thing I want is to make you feel uncomfortable. What I do want is to tell you how much you matter to our congregation, and how very grateful we are for what you have done. You are a very diverse group of people. Some of you are living a Jewish life in virtually all respects. Some of you are devoutly committed to another faith. Some of you do not define yourselves as religious at all. You fall at all points along this spectrum, and we acknowledge and respect your diversity. What we want to thank you for today is your decision to cast your lot with the Jewish people by becoming part of this congregation, and the love and support you give to your Jewish partner. Most of all, we want to offer our deepest thanks to those of you who are parents, and who are raising your sons and daughters as Jews. In our generation, which saw one-third of the world’s Jewish population destroyed, every Jewish child is especially precious. We are a very small people, and history has made us smaller. Our children mean hope, and they mean life. So every Jewish boy and girl is a gift to the Jewish future. With all our hearts, we want to thank you for your generosity and strength of spirit in making the ultimate gift to the Jewish people. Please, please…do not be shy and do not feel uncomfortable. It is important that we show you how much you have our love and respect, and there is no better time to say that than on the most important day in the Jewish year. Please come up now, and receive the heartfelt gratitude of your congregation. You are the moms and dads who drive the carpool for Mishpacha, Kesher and Temple Teen Night. You help explain to your kids why it’s important to get up on Sunday morning or to come to Temple midweek, and to learn to be a Jew. You take classes and read Jewish books to deepen your own understanding, so you can help to make a Jewish home. You learn to make kugel and latkes; you try to like gefilte fish; you learn to put on a Seder; you build a Sukkah in the backyard. You join your spouse at the Shabbat table – maybe you even set that Shabbat table and make it beautiful. You come to services, even when it feels strange and confusing at first. You hum along to those Hebrew songs, and some of you even learn to read that difficult language. You stand on the bima and pass the Torah to your children on the day they become Bar or Bat Mitzvah, and tell them how proud you are and how much you love them, and how glad you are to see them grow into young Jewish men and women. We know that some of you have paid a significant price for the generous decision you made to raise Jewish children. You have made a painful sacrifice, giving up the joy of sharing your own spiritual beliefs and passing your own religious traditions down to your kids. I hope your children and your spouse tell you often how wonderful you are, and that their love and gratitude, and our love and gratitude, will be some compensation, and will bring you joy. Yair Adonai Panav Eilecha Vi-chuneka – May the light of the Holy One shine upon you and be gracious unto you. Yisa Adonai Panav Eilecha, V’yasem l’cha Shalom – May God be with you always and grant you the precious gift of peace. It was Pharoah’s daughter, a non-Israelite (a non-Jew) nurtured that baby, who became Moses our leader, who saved our people from Egyptian slavery and received Torah for us and brought us to the gateway to the Promised Land. Similarly, you nurture your children, ensuring they grow up connected to the Jewish people. What you are doing is no less than miraculous. You are ensuring that Jewish values, Jewish tradition, and Or Ami continues to shine brightly. Thank you for being the miracle in our lives. Todah Rabbah Lachem – Thank you all very much.